The 2017 Glide is classed by Quatro as their All Round Wave SUP and comes in seven different sizes, from 8’0” (110L) to 10’2” (220L), each available in two constructions – AST or PRO. A SUP board designed for paddle cruising and use in small waves, it provides the option for a spot of ‘float and ride’ by attaching a sail to the deckplate insert just north of the central carry handle. Reviewed here in PRO construction, Quatro are quick to point out that they haven’t used carbon in the deck of the board as it would create too much rigidity, inhibiting the board’s ‘flex and pop’ for surfing. Instead, the PRO uses full sandwich technology, concentrating on flex in the deck (with the addition of double sandwich in the stance area for rigidity under the rider’s heels) and strength in the hull. The board’s design is wide and rounded, with a significant amount of tail-kick for improved grip on the wave face. It comes complete with one of Quatro’s signature deckpads, and some quality MFC SUP specialist fins. 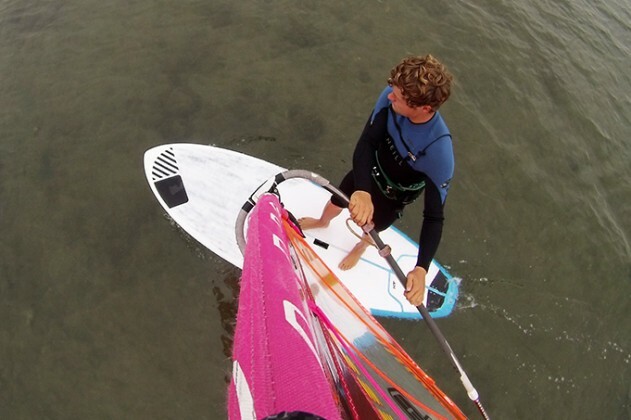 There are two leash eyelets located in the tail, for use when in SUP mode, whilst it is suggested to experiment with the central US box fin in windsurfing guise as it can significantly alter the board’s directional stability and feel. Make no bones about it – the 8’8” is a board created by one of the most highly regarded wave-oriented design houses in the world, and as such it is no surprise to realize its performance bias. The Glide is best classed as a SUP that can also be used with a windsurfing sail, rather than an all out 50-50 WindSUP. At 146L and with no central fin option, it certainly has little entry-level windsurfing appeal. It’s not really designed for windsurfing planing conditions either, the tail kick doing its job of sticking the board to the water, irrespective of the sail size used or power pushed in. What the Glide does do is offer bags of stability underfoot thanks to its 33” of width, and once on a wave-face it can be turned beautifully by driving off your backfoot, making the rails in its narrow tail bite and grip the water. As a SUP, it makes riding small (even weak) waves a great deal of fun, when the use of a surfboard would leave you unfulfilled. It can also be used for ‘float and ride’ sessions in the lightest of airs, albeit the introduction of a larger central fin than the one supplied would help it track upwind, especially in locations with stronger currents. A wave oriented toy for use with either a paddle or rig in light, marginal winds, we all agreed the Glide would be a fantastic user-friendly addition to any coastal waterman’s quiver.